Open "Safari". You will be redirected to our Firestar login page. 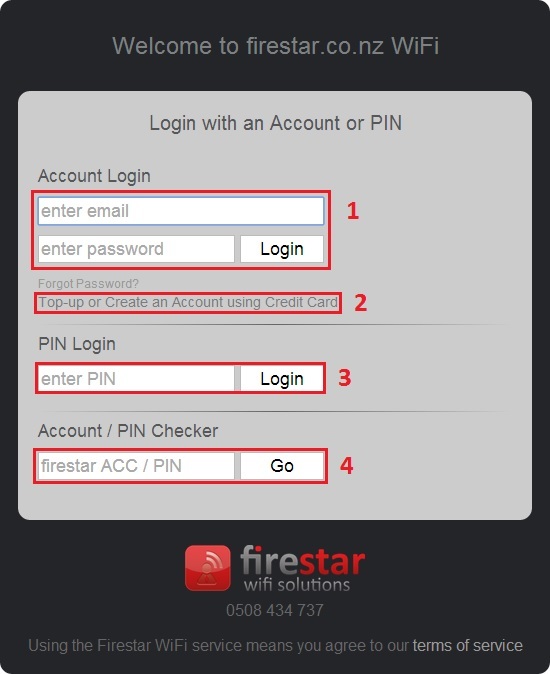 Enter your existing Firestar account (e-mail address) and password. If you do not have an account, create an account and top-up using your credit card. If you have a PIN enter it in the field provided. To check your remaining time and data, enter your account (e-mail address) or PIN. Once you have logged in you will be taken to the status page, which shows your remaining time and data and allows you to log off. Please keep this page open and open a separate tab to browse the Internet. Touch & hold "Firestar WiFi HotSpot"
To begin surfing the net you must connect to "Firestar WiFi HotSpot"
In Windows XP, go to the "Network Connections" window. Right-click the "Wireless Network Connection" and select the "View Available Wireless Network". In Windows Vista & 7, go to the "Network and Sharing Centre" window and click the "Connect to a Network" button under "Tasks" on the left. Note: Ensure your WiFi radio is on, usually a button with a WiFi icon. Click on the 'START' button and select Control Panel. Right-click on Network Connections and select Properties. Double Click Internet Protocol (TCP/IP) [version 4]. 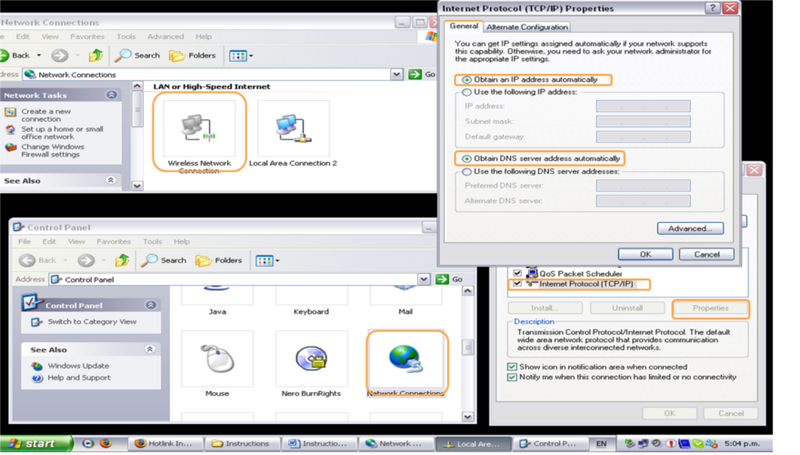 Tick the two circles labelled "Obtain an IP address automatically" and "Obtain DNS Server address automatically". Open Network and Sharing Centre, click on View Status and select Properties. How do I logout if I don't have the Status Page? 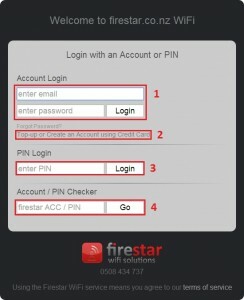 The Firestar login page will not display on my device. Note: Five minutes of your time will be deducted per page. Select "Hotlink Printer" to print. 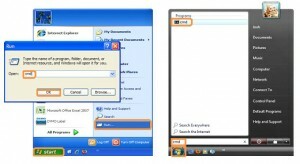 How to use CD/DVD copying and Flash Drive? Note: Ensure there is sufficient time remaining as files will be deleted when logged off. Insert the memory card into the correct slot in the card reader. Place portable flash drive into a USB port. Open the "My Computer" icon. Find and open the removable disk drive files. Go to windows desktop and click on the "How to burn a CD/DVD" icon for full video instructions on transferring files to the CD/DVD burner. To view finished files/photos, double click the "My Computer" icon and then the “CD/DVD” file icon after the burning process has been completed. Note: Please ensure that the PC you are using has a webcam, headphones and microphone. Log into a PC and double click on the Skype icon on the desktop. Skype will now ask you to create a new account. If you have an account, type your user name and password into the spaces provided. You may make free Skype-to-Skype calls, or call landlines and mobiles using "Skype credit". How do I check the data and time history on an account or PIN card? Enter the Account (e-mail) / PIN and click "GO"
Check the site's Internet connection by visiting any web page from an office PC. If the Internet is not working, restart the Broadband router. Contact your ISP (Internet service provider) if you still have no connection. Knowing there is an Internet connection, type "123" into the PIN field. If "Sorry that PIN number is invalid" appears, you have a successful connection. If you get the message "Sorry this kiosk is having trouble connecting to the Internet. Please try again or call 0508 4 FIRESTAR if the problem persists" then there is a problem between the kiosk and the Broadband router. Follow the network cable from the PC to the broadband router as best you can, checking for any loose cables. There may be components linking the PC and router, such as Ethernet switches or a MikroTik router. These and the PC may need to be restarted. 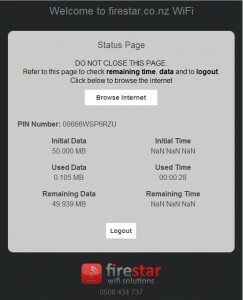 Using your laptop, check you can see and connect to the wireless network "FireStar WiFi HotSpot". If you can't, restart the Wireless Access Point. If you have a wireless connection but the Firestar PIN redirection page does not display, you will need to restart the MikroTik router. Vista/7 - Click the start Orb, type "cmd" in the search box. In the search results window click the cmd icon. The MAC address for the PC will be under the heading “Ethernet Adapter Local Area Connection” and on the line "Physical Address"